Searching for a reliable place to deposit your money for convenience is everyone's greatest concern including additional gain from interest. ACLEDA Bank Plc will offer you all the above advantages. 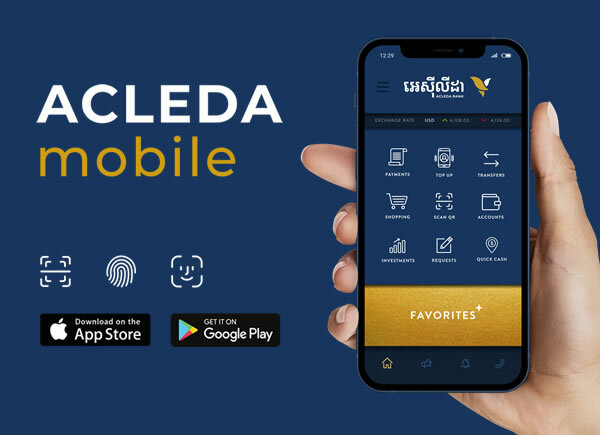 Making a decision to open a Savings Account with ACLEDA Bank, you will receive one of our attractive interest rates that you can deposit in Khmer Riel, US Dollar, Thai Baht, Euro, Vietnamese Dong, Australian Dollar, Canadian Dollar, Japanese Yen, British Pound, or Lao Kip. Interest on deposit is daily accrued and monthly capitalized. ACLEDA Bank Plc is a secure and reliable place to deposit your money with an attractive interest. Our service is delivered through online technology to ensure a convenient and efficient time for you. You don't need to carry cash around; you can use your account at any of our 262 branches in all provinces and towns. We also serve you with the most updated information technology network covering all provinces and towns to ensure your convenience to use your account everywhere our branches located. Please visit our Savings Calculator if you wish to know how much your savings will be if you put the initial amount for a period. Please click here for forms used with Savings Account. Besides deposits in Khmer Riel, US Dollar and Thai Baht, interest rate is not available.